“I’d like to say that he was coward,” said the victim Irene Sacerio. “This is not right. This is criminal. This must be punished by the law. Hialeah Police are looking into the possibility that Sacerio’s husband was being sent a message because he is the President of the building’s condominium association, according to Sacerio. “For sure he would do this for revenge because my husband Michel Delgado is trying to enforce the good law for everyone in the condominium,” said Sacerio. Sacerio told CBS4’s Peter D’Oench she was horrified by what happened to her 2005 Nissan Exterra on the night of October 28, 2013 in the parking lot of the building where she lives at 1305 West 53rd Street. The tape shows a person described as a white male between the age of 20 and 30 pouring gasoline on to the hood of the car. 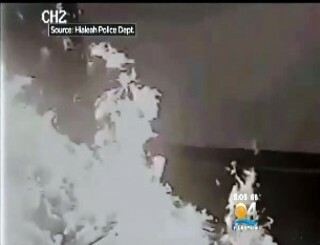 Within seconds, the car is seen bursting into flames after the gasoline is ignited. Sacerio said that’s because her car was set on fire right next to a gas pipe for the building. Sacerio did not want to show all of her face but she did want to speak out. Anyone with information about the man seen in the surveillance tape should call Hialeah Police at (305) 687-2525 or Miami-Dade Crimestoppers at (305) 471-TIPS (8477).